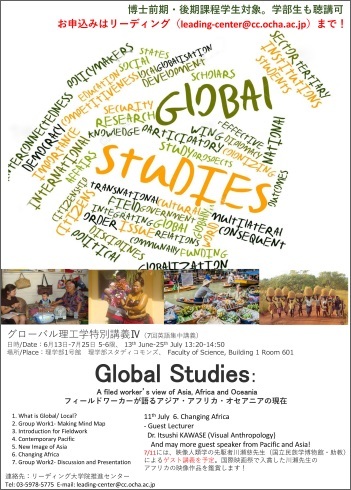 This class presents you basic concepts of Global Studies and its current topics concerns Asia, Africa and Oceania. Global Studies was developed in late 20th century as the interdisciplinary methodology to knowing about cultural, political, ecological and economic changes of globe/ local society under the “Globalization”. I will give you a widely understanding of contemporary situations of “Globalization” through few case studies to extend your image of global society. Please feel free to join if you are interested to knowing more about Asia, Africa and Oceanian culture and society. I am welcoming students from any field. I will give you an interactive lecture with various visual/ sound materials like films and photos during a class to enhance your understanding. Contemporary Pacific- Poverty or Wealth?